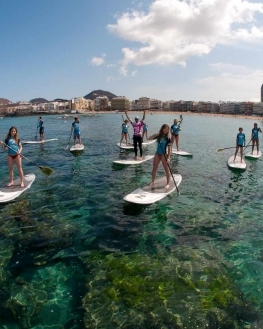 Guided tour of the Confital Bay.Departure from the urban Las Canteras beach in the city of Las Palmas de Gran Canaria.We will explore cliffs, discover inaccessible caves and enjoy the crystal clear waters, ending at the beautiful Confital beach, where we will live a magical moment of relaxation, sun, a plate of paella and a soda or beer. Guided crossing SUP of 3 to 4 hours from the urban beach of Las Canteras in the Las Palmas de Gran Canaria city to the Confital beach. Beach that characterizes it for its natural reefs that make it unique in the world. During the trip we will explore cliffs, discover inaccessible caves and enjoy the crystal clear waters, ending at the beautiful Confital beach, where we will live a magical moment of relaxation, sun, a plate of paella and a soda or beer. We are in the best area of the beach for the practice of this sport, Hotel Reina Isabel area, facing the Burger King. 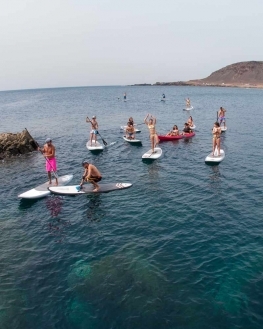 The entrance and exit is perfect for beginners, due to the natural reef that makes this bay one of the best beaches in the Canaries for this sport. Classes are preferably taught during low and medium tides. See the tide tables for Las Palmas. Reservations and cancelations must be made 24 hours in advance. 3 or 4 hour Standup Paddle Crossing. Instructor certified by the Spanish Standup Paddle Surf Federation or FCS. Turn in you­­r SUP LPA cards at the end of the course, in order to rent the board. High-quality equipment from Starboard brand boards and paddles. The Crossing are spoken in Spanish or English. See other languages. Lycra shirts and wetsuits, if necessary. Freshly made paella, beers, water and soft drinks. * Read the general conditions. Photo and / or video report. To know how to swim. It is essential to have taken a classe of initiation previously. Own the CARD SUP. 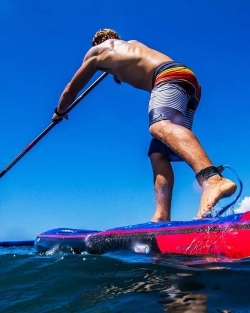 Discounts on your first purchase of SUP STARBOARD material. 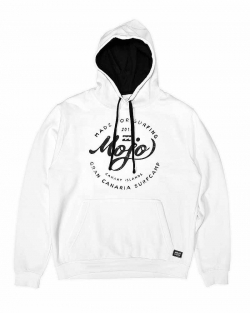 10% dto in the new collection of MOJO NEW COLLECTION. 10% discount in the rental and SUP. 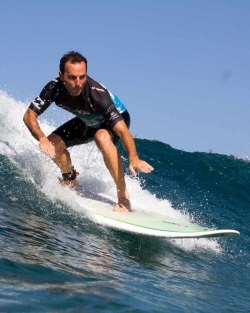 20% discount on Surf classes.